This past Saturday morning, my alarm went off at 6:00 am. I stared at the ceiling, briefly contemplating two choices. I didn’t hesitate. I chose “off” over “snooze” and forced myself upright. It wasn’t easy. Groggy from Nyquil, I was nursing an impressive cough, and most of my body ached. I wouldn’t have done this for many trail races. But, Les KM de Chando has earned that effort from me. Only in its third year, the race is taking its place as one not to be missed amid the myriad of trail races in Switzerland’s Valais’ Alps. Others seem to agree. In attendance at this low-key race in the mountain town of Chandolin were a number of trail running legends. For a race that had fewer than 200 registered runners, it must have the highest ratio of big-names-to-recreational runners going in all of Europe. I was running amid a whose-who of Alp trail running. There’s elite Swiss ski mountaineering racer Martin Anthamatten. Victoria Kreuzer, a world-cup “ski mo” racer, who’s been racking up wins in steep trail races around the region. Emmanuel Vaudan, former holder of the World record for the Vertical Kilometer. Noted tough, senior runner and all-around character Billy Burns, one of the most successful trail runners ever to come out of Great Britain. The high-elevation finish of the double KM, atop L’illhorn features stunning views of the Valais and Bernese Oberland Alps. Two others showed up for the race, as well: Kilian Jornet and Emilie Forsberg, currently the International Skyrunning Federation’s world champions. Kilian’s ski mo friend David Salamin started Les KM de Chando. Tragically, Salamin died while climbing on the Weisshorn, the winter before last. So, the race had a certain poignancy for Kilian—and for many others present that day, no doubt. Just under the surface, though, was one of the most remarkable performances of the day. 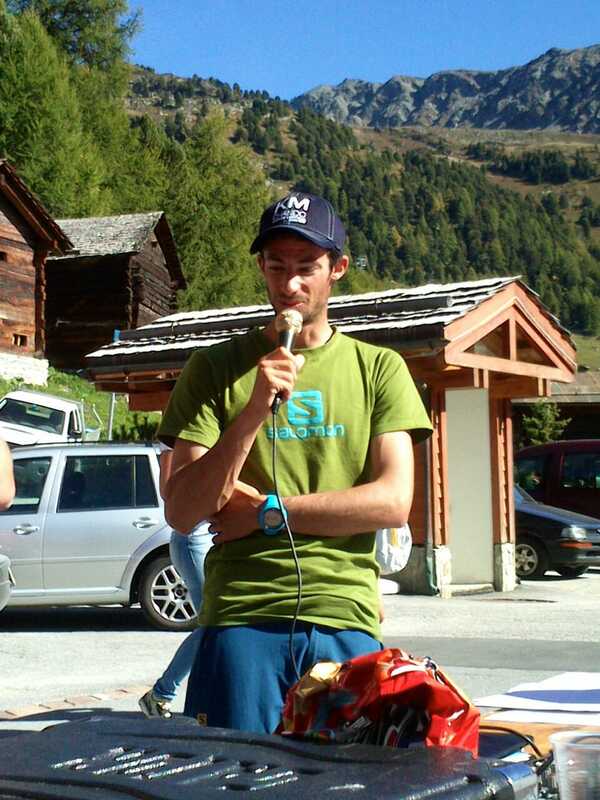 Billy Burns, fully 18 years older than Jornet, came in second– less than two minutes off Kilian’s record-setting pace. The American invasion! Back row: Jim Malachowski, Doug Mayer. Middle: Alison Malachowski, Brandy Malachowski, Kacy Grimaldi. Front: Jim Frey, Nick Pate, Katie Frey. It was a great day for everyone present, with no shortage of smiles and laughs. Chando is an incredible experience– classic fall Alp racing, with a course that’s totally unrelenting… followed by a lively Valais lunch in the village, as a great fall day in Switzerland wound down towards its inevitable close. My day ended as it had started, back in bed and in need of some rest. But, this time, there was a big smile on my face.